Unusual version of the George Nelson miniature/jewelry chest #5215. This one features the white formica on the bottom of the case not the top as is more typical. 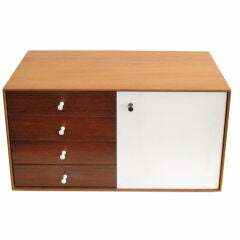 Teak wood construction with original porcelain knobs. Great patina that shows it age beautifully. 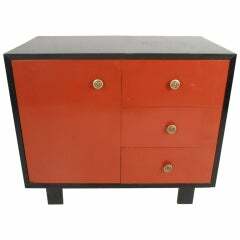 A rare George Nelson for Herman Miller miniature chest, #5211, from the "Thin Edge" series. Teak case has beautiful graining. Door in white laquer. A classic George Nelson sling sofa made by Herman Miller. Chrome and black leather, original rubber sling. 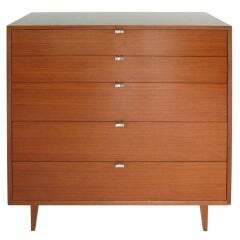 A Classic George Nelson five-drawer chest for Herman Miller with Y-shaped handles. 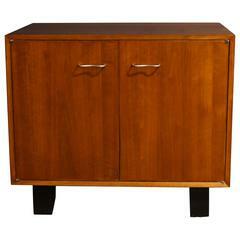 A great George Nelson credenza for Herman Miller, circa 1950s. Primavera with original hardware and rare harpin legs. Completely restored, hardware polished. 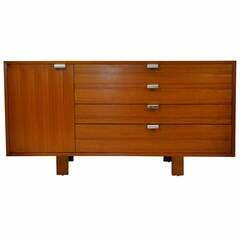 George Nelson cabinet for Herman Miller. 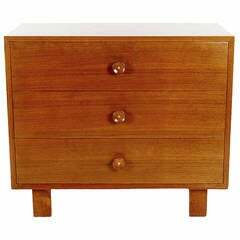 A nice low key chest designed by George Nelson for Herman Miller. 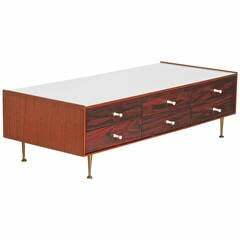 It features walnut legs and walnut pulls on walnut case. Manufacturer label.